July 1st 2014. Hello from Buea! We are now in our third week of Coaches Across Continents training here in Cameroon, working in Buea with United Action for Children. 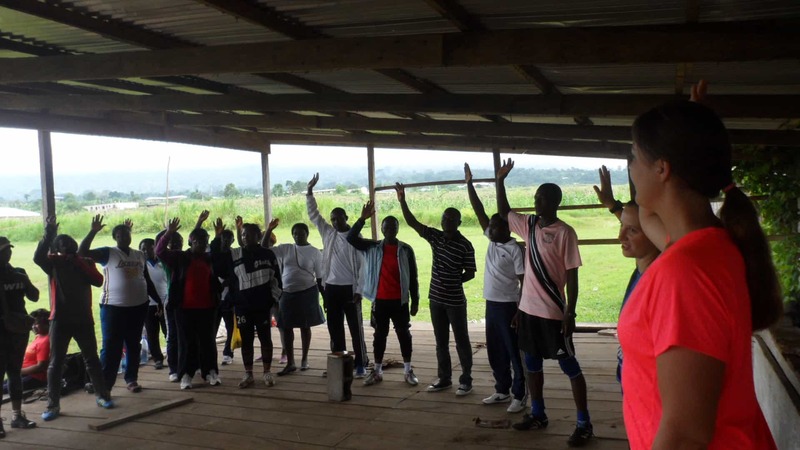 We had many new coaches and teachers from around the Buea area join us this week. 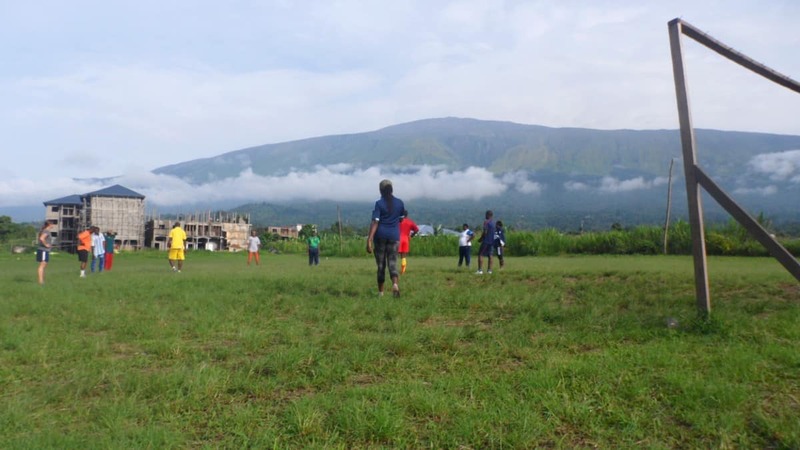 Buea sits at the base of Mt. Cameroon which made for a breathtaking view from the field every day. The coaches pinpointed gender equality, nutrition, and HIV as the social issues in their communities that they wanted to address this week with CAC’s curriculum, so we tried to place added emphasis in these areas. On our second day of CAC training, we played a nutrition game with the coaches that taught about what a balanced diet consists of and why it is important to eat healthy foods. For every scored goal, that person was allowes to pick out either a carbohydrate, fat, or protein (represented by cones, water bottles, and balls), to build a healthy meal. Once the team that had two healthy meals consisting of one carb, one fat, and one protien each, they win! This game sparked up a great conversation about healthy foods in the communities in Buea, its availability, and the issues that keep people from making healthy eating choices. We stayed at the UAC volunteer house this week, with other volunteers from Germany and the USA. It was nice for all of our Cameroon Coaches Across Continents staff to be together in the same house. We were able to easily meet, discuss how the day went and plan lessons for the next day between training, meals, and the evening world cup games. Watching the World Cup games at a nearby bar was definitely a highlight of the week. Unfortunately, Cameroon lost this week, but that didnt seem to effect the spirits of the coaches this week. They kept us on our toes and kept us laughing all week. On our last night in Buea the UAC staff invited us out to an end of school year social gathering for their teachers and staff. The food and drinks were delicious, the music was loud and the dancing was a lot of fun! It was great to spend some time outside of training with some of the coaches we had been working with all week. Sophie, Josh and I had fun laughing at each other as we tried to dance to the different music. I think the locals were entertained by our dancing, too. In the end, we could not keep up with energy level of the UAC staff members. Some of them were up dancing until midnight! Its crazy to think that next week is my last week with Coaches Across Continents. We will make our way to Kumba for our final week in Cameroon working with CFDP (Cameroon Football Development Program). 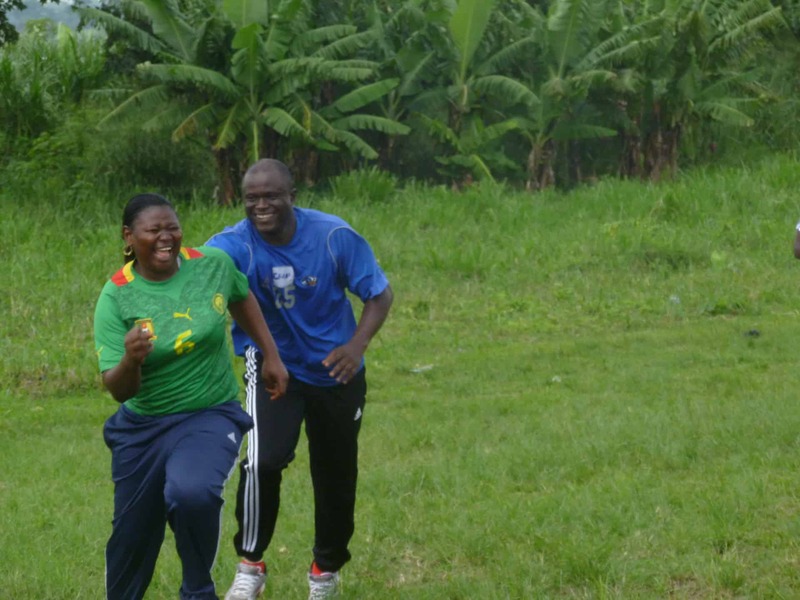 Coaches Across Continents’ participant Martha runs away from Community Impact Coach Kama.